The AP420 offers fast speeds to support those latency-sensitive services like voice, video, and data downloads over Wi-F and comes with a 4x4 MU-MIMO dual radio to connect a crowded room full of devices simultaneously. 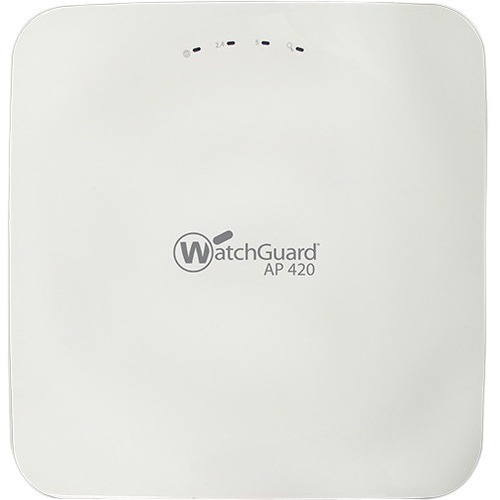 This AP also offers dual concurrent 5 GHz and 2.4 GHz band radios supporting 802.11a/n/ac Wave 2, 802.11b/g/n, 4 spatial streams, and data rates of up to 1.7 Gbps and 800 Mbps, respectively. With a 3rd MIMO dual band radio for dedicated WIPS and RF optimization (available with Wi-Fi Cloud license) you don't have to sacrifice performance for security. Ideal for tradeshows, auditoriums, meeting rooms, and shopping malls. A Firebox or XTM appliance is not required for AP420 units managed by the Wi-Fi Cloud.